My local TRU restocked with more of these. There were a few others I left behind, including a ‘69 GTO, Mini Cooper, 90's Camaro, etc. among others. Can’t get all of ‘em, you know, especially since these are overpriced to the max. Couldn’t leave these four behind though. Plum crazy Challenger is a must-have. The Camaro actually looks like it’s worth the price tag. It’s the only one of the four with rubber tires, plus that BFG lettering on them. The Mustangs are both ‘69 Shelby GT500's, in coupe and convertible forms. 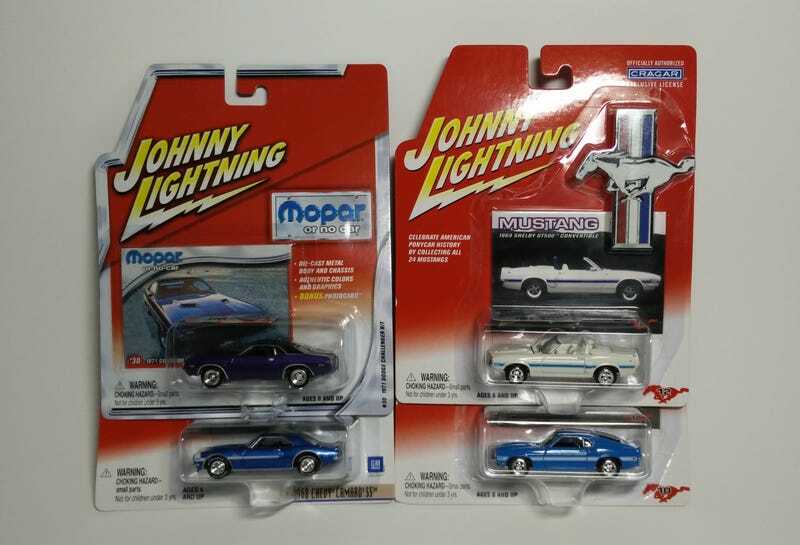 Don’t see too many ‘69 Shelby’s out there, so these will be very welcome in my collection.